If you have filed for bankruptcy, seeking a discharge of your debts under Chapter 7 or a structured repayment plan under Chapter 13, the bankruptcy trustee assigned to your case may assume (continue) or reject (breach) any contracts or leases you list in your petition for which you and the other party have yet to perform. However, there may be certain contracts you'd rather not breach. For example, an automobile lease with payments much lower than you could currently negotiate or a contract to purchase equipment for your business at a bargain price. 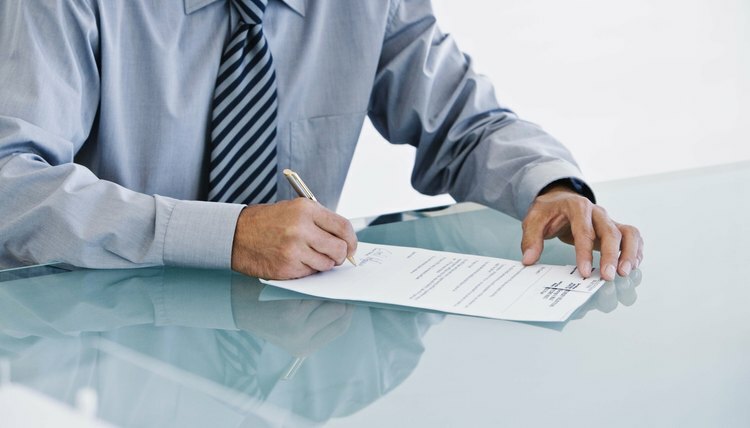 In such cases, there may be steps you can take to avoid a breach of contract. At the time you file your bankruptcy petition, provide the court with a schedule listing all of your contracts and leases, including any contract you would like to avoid breaching. In addition, if you are behind on payments due under the contracts listed, you must list the amounts due on a separate schedule of your debts. Consider filing a Statement of Intention to assume the contract or lease you don't want to breach along with your bankruptcy petition.This will alert the trustee that you would like to assume the contract, although the final decision will be up to the trustee. If the contract or lease is likely to generate money that may be used to pay your creditors, the trustee may decide it would be a sound business judgment to assume it. If the contract represents a liability, it is likely to be rejected by the trustee. Make certain that the trustee files a motion to assume the contract you don't want breached -- provided the trustee has not decided to reject it -- within 60 days after you file for bankruptcy to avoid its automatic rejection under bankruptcy law. If the trustee decides not to assume the contract, it will be treated as breached at the end of the 60-day deadline. Provide written notice of your intention to assume a lease of personal property, or a copy of the Statement of Intention filed with your bankruptcy petition, to the other party to the contract if this is the type of contract you want to avoid breaching. The other party is not required to agree to allow you to assume the lease and may require you to make payments you have missed as a condition for allowing the lease to continue. Comply with the terms of your contract to avoid a breach after you assume it in the bankruptcy proceeding. Your contract, if it is assumed, will continue to be in force according to its original terms with only a few exceptions provided by the U.S. Bankruptcy Code. File a repayment plan with your bankruptcy petition, or within 14 days after filing the petition, stating that you would like to assume the contract you don't want breached. In a Chapter 13 case, a contract can be assumed or rejected by the trustee any time before the confirmation hearing unless the court orders the trustee to decide in a shorter time period. A separate motion is not necessary when a repayment plan is filed with the court. File the same schedules required for a Chapter 7 bankruptcy. A Statement of Intention is not required in a Chapter 13 case. If you are concerned that the trustee will refuse to assume the contract, consider leaving the contract out of the papers you file in the bankruptcy proceeding so the contract will be unaffected by it. Begin making payments to the trustee under the repayment plan, or the other party to the contract, within 30 days after filing your petition, even if the plan has not yet been approved by the bankruptcy court. If the court approves the plan, or a modified plan, you will be required to make all payments due under the assumed contract. Bankruptcy is a legal process by which debtors may restructure or obtain relief from overwhelming debts and get a fresh start on building a positive economic future. The bankruptcy court process has stringent rules and timelines to insure the debtor and creditors are treated fairly. Failure to abide by these rules may lead to dismissal of the bankruptcy, but in most instances, the debtor will be allowed to refile. A successor trustee of a trust is the party appointed to replace the trustee named in the original trust deed. There are a number of ways to replace a successor trustee and none of them absolutely require that you retain a lawyer. Keep in mind that state laws vary somewhat on the process of replacing a successor trustee.